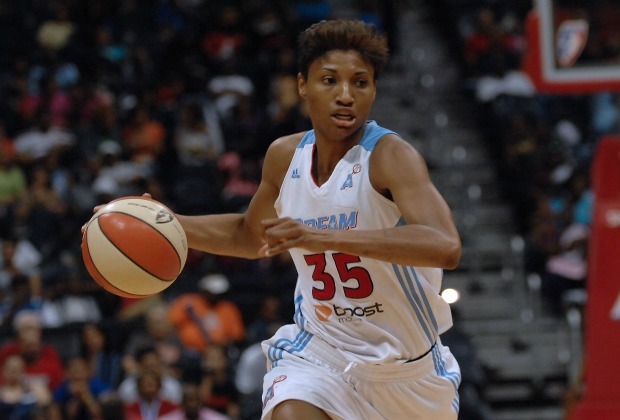 In convincing fashion, the Atlanta Dream defeated the visiting Chicago Sky 97-59 on Saturday. Atlanta center Erica De Souza and guard Angel McCoughtry were on fire, each scoring 20 points against the Sky. Forward Sancho Lyttle had 12 rebounds, while guard Shoni Schimmel had 7 assists. Atlanta set a team scoring record at the end of the first period with a 30-16 lead against the Sky. It was all downhill from there, as the Dream continued their high scoring pace with 56-31 at half-time and ending with a final score that set a new record for the Atlanta franchise. The win against Chicago ends a three-game losing streak including defeats against Connecticut, Indiana and a loss to Chicago when forward Angel McCoughtry sat out due to injury. The Atlanta Dream have been able to step up to the plate during the regular season over the past few years, but have fallen short in the WNBA Finals. In 2010, it was against Seattle and against Minnesota in 2011 and 2013. De Souza is optimistic about the Dream’s season and believes that they can make a comeback and win the Championship this year. “I think that step by step, we can win the finals, win the championship.” De Souza said. Coming into the regular season the Dream are one of the favorite teams in the Eastern Conference. Currently, they have a 5-3 win/loss record. This ties them for first and second respectively with the Chicago Sky in the Eastern Conference standings. If the Dream can keep up their winning ways then they have a chance at winning the coveted WNBA title. The team continues their road to the championships with a match against Minnesota, who comes into the game with an 8-1 record on June 13th at 7:30 p.m.